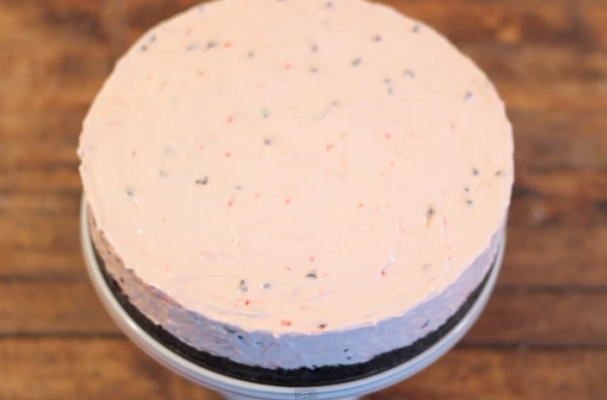 Chocolate and peppermint are a classic holiday flavor combination and a cheesecake is the perfect way to show them off. With so many places to go and people to see during the holidays, most of us do not have time to spend all day in the kitchen preparing a fanciful Christmas dinner and dessert. This no-bake peppermint Oreo is a simple and festive dessert that will please everyone at the table. Crushed Oreo cookies form the crust while the cheesecake batter is made from a combination of sweetened condensed milk, whipping cream and of course, cream cheese. Red and white chopped peppermint candies (also known as peppermint snow) are scattered throughout the creamy white batter like confetti along with miniature chocolate chips. Best of all, this cheesecake can be made ahead of time so that you can enjoy your holiday festivities. It can be prepared up to two days in advance. Keep in mind that while this dessert does not require the oven, it needs at least 8 hours to set prior to serving. No-bake peppermint Oreo cheesecake just might become the next holiday staple that your family craves every year. For full recipe instructions, watch the video below or visit the website here.